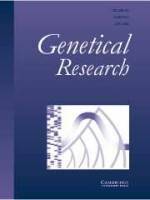 Genetics Research is a prestigious, well-established journal which publishes original work of high quality and wide interest on all aspects of genetics. Major areas of research covered include population and quantitative genetics (both theoretical and experimental), QTL mapping, molecular and developmental genetics of eukaryotes. The breadth and quality of papers and book reviews make the journal invaluable to professional geneticists, molecular biologists, plant and animal breeders, medical scientists and biologists involved in evolutionary and developmental studies.